It’s good to be the best, but how are the best decided? That’s the question that officials from USD’s office of marketing communications & university relations have to decide every time the university lands on a new college ranking list. On Friday, USD was named as one of “the top 20 best value law schools,” by Prelaw Magazine, coming in 13th among over 200 accredited law schools and in September, the Beacom School of Business landed on the Princeton Review’s list as one of the top 25 online MBA programs, coming in at No.11. These are only some of the many lists that USD lands on each month which are published in press releases on the university’s website. Tena Haraldson, the director of communications and media relations for USD, said her office makes the decisions on which rankings to publicize. 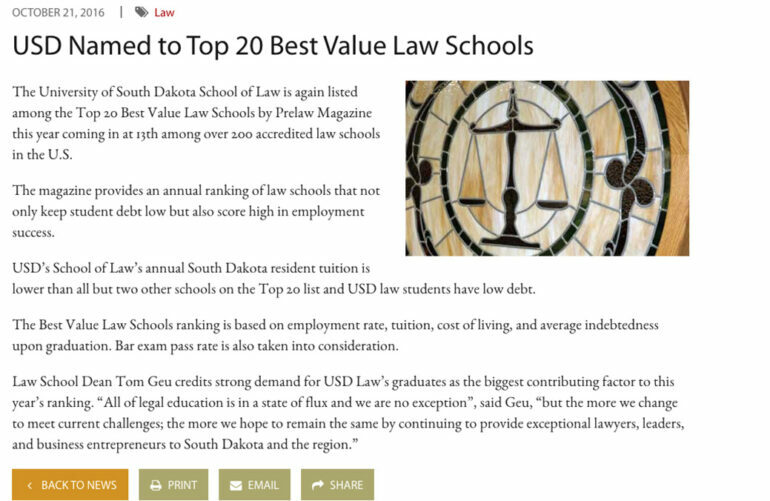 In the case of USD’s law school finding its way onto the best value law schools list by Prelaw Magazine, the ranking was based on employment rate, tuition, cost of living and average indebtedness upon graduation. Bar exam pass rates were also taken into consideration. Most of that data came from ABA 509 forms, paperwork required by the American Bar Association every year. The employment data used was a modified number that comes from a calculator tool made by the Institute for the Advancement of the American Legal System, according to an email from Katie Thisdell, the managing editor of Prelaw Magazine. Haraldson said the methodology behind how USD ends up on lists plays a large part in whether or not the lists are published.